I just received an invitation to the opening of a new exhibition this Saturday to William Wolff: Persons and Portraits, at Art Zone 461 Gallery, between 5:00 – 8:00 pm. “Wolff’s work is bold and powerful and communicates something very visceral in his woodcut prints. These prints speak from a different age, or a different worldview. They speak in a language of direct experience rather than reflected experience. There is no irony, nor really any artifice. The woodcut prints are a presence in themselves and feel iconic and sculptural. 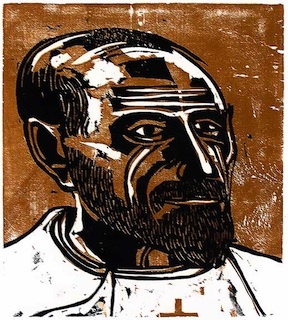 "C: De Foucald", 1975, color woodcut, 11 1/2" x 10 1/2"